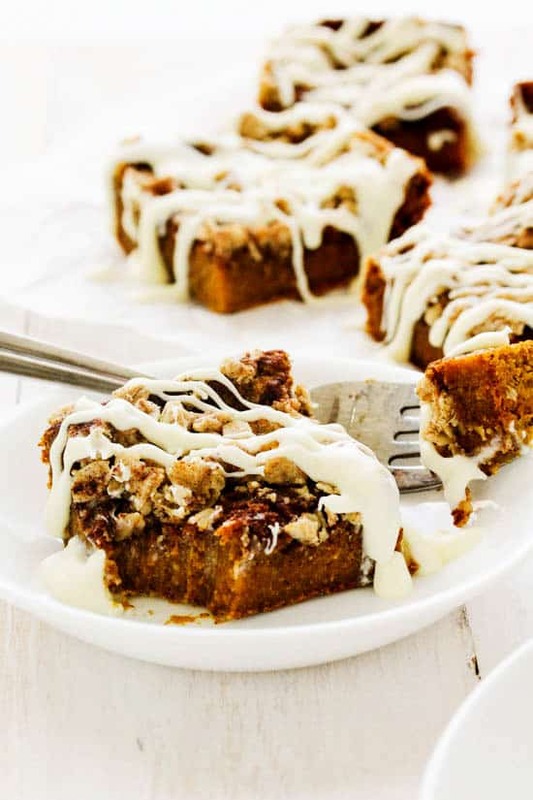 Enjoy the light, fluffy, deliciousness of a traditional crumb cake, but with a pumpkin-y twist! 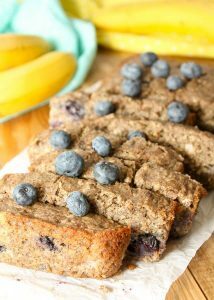 The cake is perfectly sweetened with the help of nature’s candy – fruit! 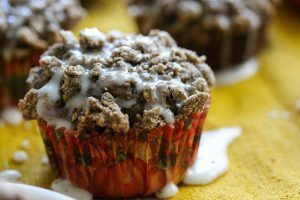 It also has that dense, melt-in-your-mouth goodness of a crumb topping. We all know pumpkin is just about the most popular foods for the winter holidays…particularly Thanksgiving. But, I say, stock up on those cans of pumpkin now, so you can have pumpkin all year long. 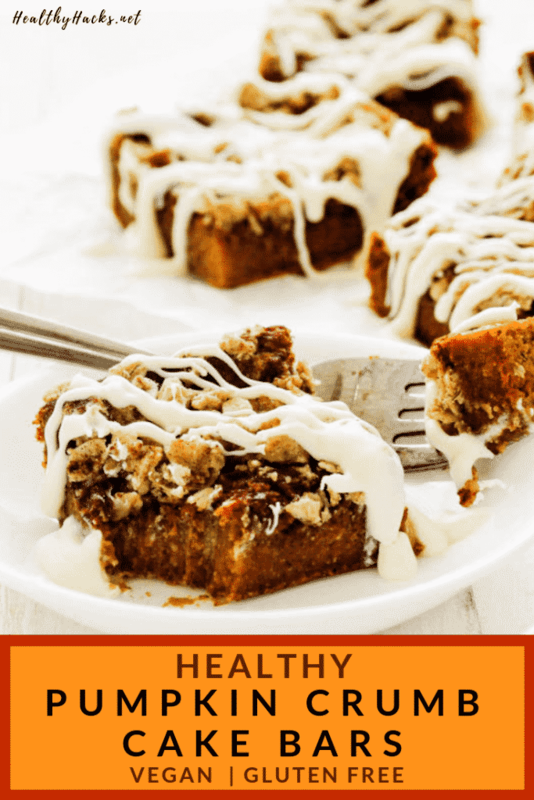 Especially when you have recipes like this Pumpkin Crumb Coffee Cake to make! 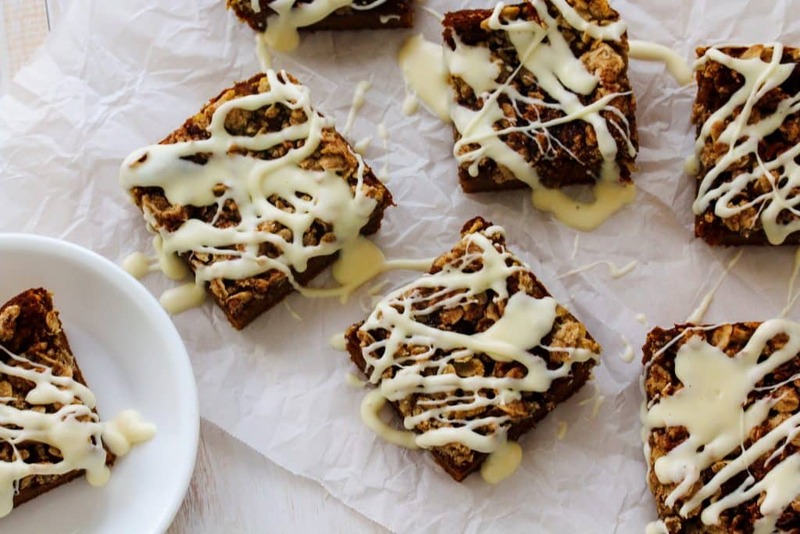 Why would you only want to eat something so delicious during the cooler months!? When you sit down to eat something delicious, I’m pretty sure the last thing you’re thinking is, “These antioxidants, potassium, vitamin A, and fiber sure are scrumptious.” But, you could! 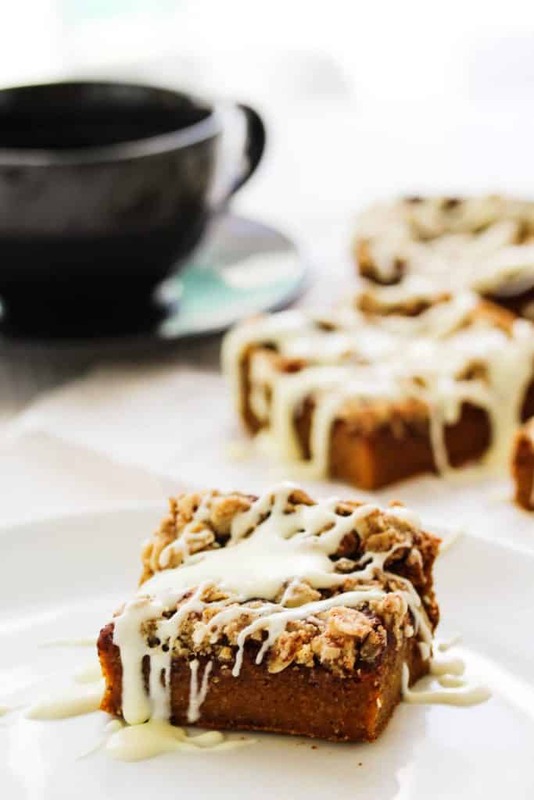 You could totally be thinking that while you eat this fluffy-like-a-cloud coffee cake that could rival any from a coffee shop. 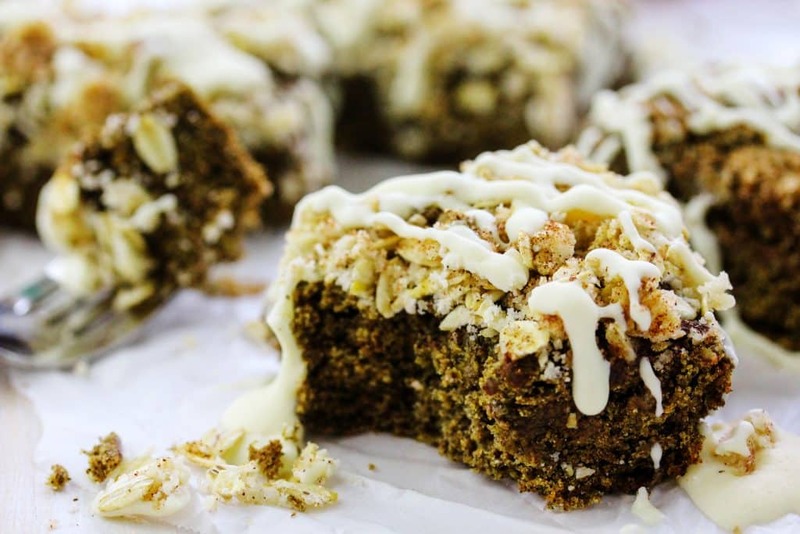 Crumb cakes/coffee cakes have always been one of my favorite desserts. The buttery, silky cake with the sweet, slightly crispy/crunchy topping just complement each other so well. Plus, they’re always loaded with cinnamon. And if it didn’t make you cough or gag I’d probably eat cinnamon by the spoonful. There are also two options for this cake. Oddly enough, switching out one simple ingredient changed the whole texture of the cake! For all the pics above I used oat flour. You can see the cake is a little denser and it has more of a creamy, pumpkin pie texture. But if you switch the oat flour out for buckwheat flour you get a lighter, fluffier, more traditionally textured crumb cake. Personally, I like the buckwheat flour version better. But, I really loved them both so much, which is why I had to share both versions! You can see the cake-y texture of the buckwheat version in the pic below. Whichever version you choose, you won’t be disappointed! Now run to the kitchen and get your pumpkin on! Preheat the oven to 350 F. Prepare an 8”X8” square pan with cooking oil or parchment paper. For the crumb topping: in a small bowl, combine the rice flour, oats, and salt. Using a fork, mash in the coconut oil and the maple syrup. You should end up with a crumbly mixture. Place the mixture in the fridge to harden slightly. In another small bowl, mix the cinnamon and sugar together. For the pumpkin cake: in a bowl, mix together the pumpkin puree, mashed banana, yogurt, and maple syrup. In a separate large bowl, combine the buckwheat (or oat) flour, rice flour, cornstarch, cream of tartar, baking soda, spices, and salt. Add the pumpkin mixture to the dry ingredients and stir until well combined. Pour the cake batter into the prepared pan. Smooth the batter out evenly. Crumble the crumb topping over the cake batter, then sprinkle the cinnamon mixture over the crumb topping. Bake the cake for 21-24 minutes or until the top is browned slightly and a few crumbs come off a toothpick if inserted into the center. Allow the cake to cool slightly in the pan (about 10 minutes), then remove it and allow it to finish cooling on a wire rack. Cut the cake into squares. Drizzle it with some powdered sugar + water mixture if you like (and who wouldn’t! 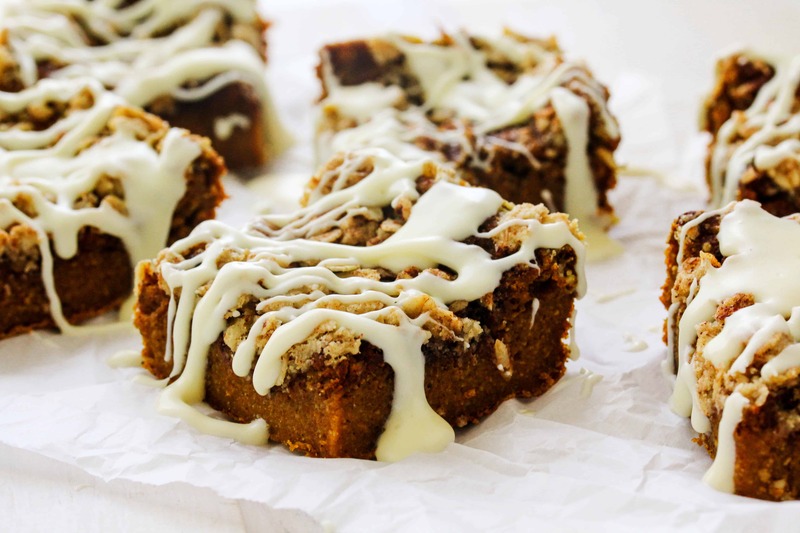 ), grab a cup of coffee and enjoy your perfectly spiced pumpkin crumb coffee cake!